"Thank you dear sister, greatest of all sisters, without whom I'd never survive." The Charlie Brown and Snoopy Show aired on Saturday mornings on the CBS network from 1983 - 1986. Only 18 episodes were ever produced. * Peanuts, from TV Tropes. 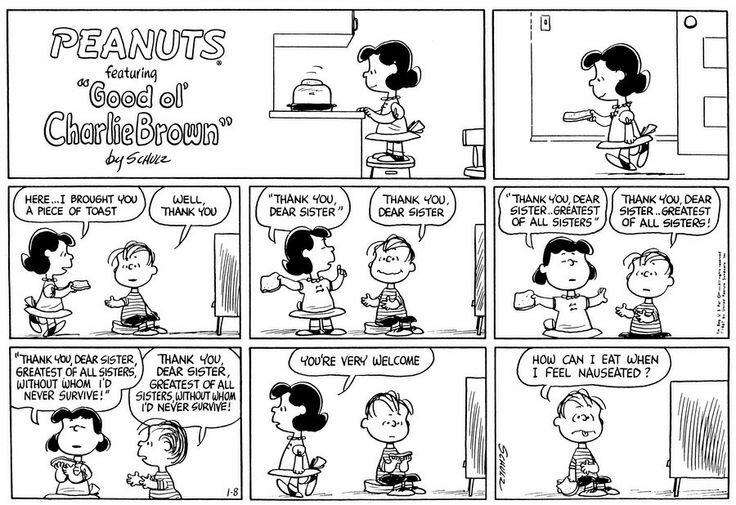 * The Lucy and Linus scene linked above was based on this strip. 1978: What a Nightmare, Charlie Brown! 1983: Is This Goodbye, Charlie Brown? 1983: What Have We Learned, Charlie Brown? 1986: Happy New Year, Charlie Brown! 1990: Why, Charlie Brown, Why? * "The Birth of the Constitution"
* "The Wright Brothers at Kitty Hawk"
* "The Building of the Transcontinental Railroad"
* "The Smithsonian and the Presidency"
* "The Music and Heroes of America"
The fact that 'Race For Your Life, Charlie Brown' still doesn't have a DVD release is a continual source of WTF-ness for me, especially now that there is a Baby Mintcake toddling around. That sucker was one of those first-couple-of-things-we-taped-off-HBO VHS tapes that my family watched about a zillion times. Do it, Paramount/whomever. I still have the horrible bubblegum from Snoopy, Come Home stuck in my head. CB is a bit of a creeper about the little red-haired girl. I remember Race for Your Life, Charlie Brown being utterly terrifying, but I've not seen it since I was a young child so I don't remember why. mintcake! : It's not ideal, but they do have Race for Your Life, Charlie Brown on Youtube, though broken into parts. Here's part 1. Also, this show looks surprisingly not crummy for a Saturday morning cartoon series. I'm guessing having original creative team Lee Mendelson and Bill Melendez still on-board contributed to that. 'Race For Your Life, Charlie Brown' was apparently released on DVD in Feb. 2015. According to Wikipedia, it's also been released in VHS, Betamax, Laserdisc, and RCA's CED format. The characters are repeatedly menaced and attacked by bullies and a vicious cat named Brutus. Charlie Brown is left behind at a bus stop twice. Later in the movie, there's a storm and Woodstock gets lost. It could easily be scary to a little kid. If nursing prolonged unrequited childhood crushes counts as creeping these days, then I guess everyone has a dark history of creeping. Race for Your Life, Charlie Brown had a memorable dynamite blasting sequence that I thought was pretty scary. And Snoopy, Come Home is a guaranteed tear-jerker. I love that movie so much. WHAAAAAAAAAAT - ordering now. Thanks, ZH! Now I have to make up for the four months I could've been watching this. Nobody ever believes me when I tell them about 'Why, Charlie Brown, Why?' (It's the one where the little red-haired girl gets cancer). Now I have proof. Thanks. And then of course, there's Bring me the Head of Charlie Brown, from someone who insist watched way too many of these Armenians m specials. The existence of Flashbeagle says a lot about the 80s. Though I also recall they manufactured a Snoopy doll dressed as Boy George, which was pretty subversive for the Reagan era. It was scary to a non-little kid (me). I was going to express dismay for it being this far into the thread and there being no mention of A Peanuts Halloween II: Electric Boogaloo. Then some Googling seems to indicate that there's only one site of it left on the web. That fills me with great dismay. You all must read it, and then reproduce it so that bit of hysterical BBS-i-cana doesn't die. FLASHBEAGLE! That's my childhood. Must show it to my kids pronto. It isn't the little red-haired girl, it's Linus's crush. Man, there were so many educational shows/cartoons about leukemia during my childhood. Which was the one where Snoopy and Woodstock have to get back to Needles for Life Day? Did things ever get better after "You're in the Super Bowl, Charlie Brown"? That thing hit me as such a low at the time that I stopped reading the strip too. Most if not all of the missing specials can probably be found at this YouTube channel - under deliberately deceptive names, so start digging. Also, one 'episode' seems to be missing from it and I don't know which. I remember what-used-to-be Disney Channel airing the series after-school in the early 90s, but I don't remember there being that few episodes. I recently had the opportunity to visit the Charles Schulz Museum in Santa Rosa (CA) and it really brought home the humanism in Schulz's work and more than a little nostalgia for the days when Snoopy - a stuffed animal whose neck was hanging on by a thread to his body* - was my best friend. The museum is truly worth a visit if you are in the area. I went straight home and watched a number of the old specials back to back. I'll be saving this thread to continue that endeavour. Thanks for all the work putting this together! *I believe my mother had to sew his head back on at least a couple of times.